Need more information about booking Home 7260388 ? 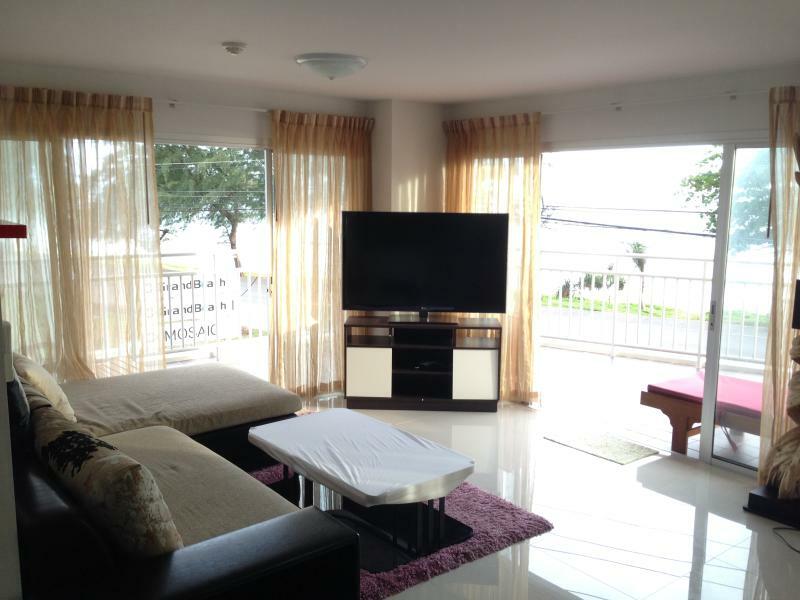 Beautiful 2 bedroom apartment with a nice large patio facing directly the beach. The apartment has a fully equipped kitchen and a 55-inch flat screen TV and DVD player. Located in the residential area of Mae Phim Beach, you can rent a motorized tricycle, motorcycle or car from us to go around the area, which has long beaches and plenty of restaurants and shops. The apartment is on the first floor and accessible by elevator. There is a beautiful infinity pool on the rooftop overlooking the ocean. it does not have Wifi. Electricity charges separately (consumption depends largely on use of aircon). Full management of the property onsite. You can get in touch with Alejandro (the owner) through the contact form on this page. Send Alejandro (the owner) an email through the contact form on this page. Alternatively, if there’s a phone number on this page, you can call them. How do I contact Alejandro (the owner)? If you’ve already booked, go to Manage your holiday booking to view Alejandro the owner's contact details or send them a message. Or send Alejandro (the owner) an enquiry through the Contact the owner/manager form if you’d like a quote or more info first. When you pay online through the Book your stay form, a booking request is sent to Alejandro (the owner). You’ll find out within 24 hours whether they’ve accepted - no money will leave your account before then. You can also request a quote from Alejandro (the owner) through the contact form. The owner will email you the total cost for your dates and a link to book and pay online. Use the Book your stay form to pay provisionally online. You can pay by credit/debit card or PayPal. Alejandro (the owner) will have 24 hours to accept the booking and no money will leave your account before then. Why can't I call Alejandro (the owner) before booking? You’ll need to contact Alejandro (the owner) to do this. Send them a message in Manage your holiday booking or through the contact form on this page. You can request to change the dates or number of people on your booking via the Manage your holiday booking page. To change your holiday dates use the Edit booking button. If you need to change the number of guests staying then send Alejandro (the owner) a message. If Alejandro (the owner) agrees, they’ll send you a revised quote outlining the changes. You can review and accept/decline this from the Manage your holiday booking page. You’ll have 48 hours to take action before the revised quote expires.